Vultr offers virtual private servers on high-performance SSD disks and Intel Skylake CPUs in sixteen locations across nine countries. Their standard plans are priced at $5/mo per GB RAM, although their cheapest plan is $3.5/mo for 512 MB RAM. First, their control panel is jam-packed with features! I’ll go through the features in detail later, but the features that I have found most useful are hourly billing, snapshots, custom ISOs, and block storage. These are available both from Vultr’s control panel and from their API, and make their platform suitable for running many different types of applications. Take a look at the number of tabs that they needed to add to their panel to fit in all of their functionality! Second, the diversity of their locations is unmatched by any other provider that we’ve reviewed, and Vultr regularly adds new locations (their Toronto datacenter just launched in December 2018!). I’m amazed every time I look at their datacenter map. 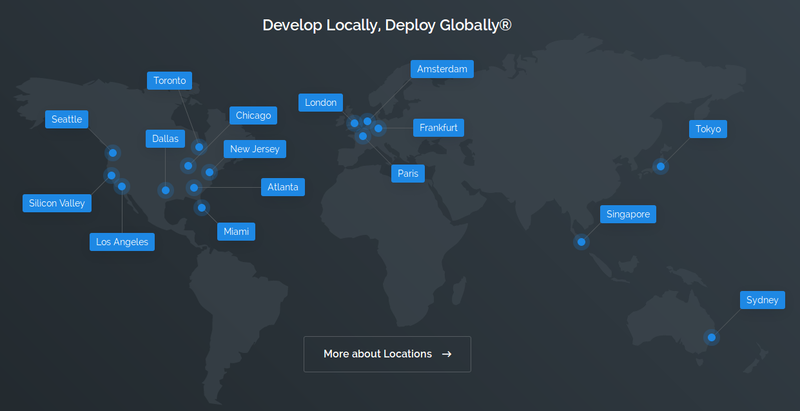 When deploying on Vultr, you have 16 locations to choose from! Despite being a relatively new provider (Vultr was founded in 2014), they have rapidly expanded and improved to be among the best VPS providers on the market, and we ranked them #1 in our 2019 Best VPS Provider Ranking. Their servers are speedy and reliable, and you really can’t go wrong with picking Vultr as your provider. If you want to skip the rest of the review and try them out now, you can get started with a $5 free trial! I’ve already mentioned this, but I can’t stress it enough — one of the biggest advantages of Vultr is their global footprint. As you can see from the map above, North America and Europe are well covered by Vultr datacenters, and Vultr also has locations in Japan, Singapore, and Australia. Being able to deploy servers in different regions of the world with the same provider saves a lot of headaches, as you can trust that you’ll get the same reliability and hosting quality, and don’t have to pay 10 separate bills. I could write an entire post about every one of Vultr’s features, but I’ll do my best to summarize them here! Let’s start with hourly billing, which isn’t really a feature so much as a pricing model, but is super useful nonetheless. Vultr’s VPS are billed hourly, not monthly: when you deploy a $5/mo VPS, you’re really paying $0.007 (less than a cent!) every hour that the VPS is active. This is perfect for testing new software. If you find a cool project and want to give it a try, you can deploy it on a VPS for just a few hours and delete it when you’re done. With hourly billing, you’ll only be charged tens of cents for the VPS! Hourly billing is quite common nowadays, but there are still many VPS providers that bill monthly, and many users who are not aware of the freedom that hourly billing gives you. The first actual feature that I’ll discuss is snapshots. A snapshot is basically just a copy of the disk of a VPS at a certain point in time. You can use a snapshot as a backup before performing a complex upgrade; if something goes wrong, you can always restore your VPS back to its earlier state. Snapshots can also be used to clone a VPS. If you spent a lot of time configuring your application, and later want to deploy multiple copies of it, you can simply create several VPS from a snapshot of your first VPS. Next, their block storage service lets you attach an additional virtual disk to a VPS for extra storage space. You can detach the disk from a VPS and attach it to another VPS at any time. 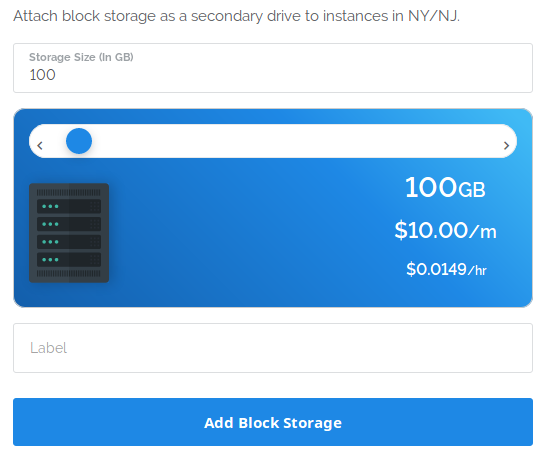 Unfortunately, Vultr’s block storage is still in “BETA” and only available in their New York location. Also, the pricing is quite high compared to other providers, at $100/mo per TB of storage. Vultr also offers DDoS protection for $10/mo, on top of the price of the VPS plan. I have limited experience with their DDoS protection, but it is a handy add-on if you’re running game servers or anything else that attracts frustrating DDoS attacks. Lastly, when deploying a VPS, Vultr allows you to specify startup scripts to execute when the VPS starts up the first time, and SSH keys to inject so that you can authenticate into the VPS without a password. There are tons of more minor features (DNS hosting, backups, custom ISOs, etc.) that I haven’t gone into, but those are the most exciting features on Vultr, and they are indeed quite exciting! Vultr’s pricing is on the higher end of the spectrum, at $5/mo per GB of RAM. Their smallest plan does make up for it a bit, letting you go down to 512 MB for $2.5/mo. However, this plan doesn’t come with an IPv4 address (only IPv6), and you’ll have to pay an extra $1/mo if you need IPv4 access (which you almost certainly do). Vultr’s Dedicated Instances are also quite expensive, at $30 per dedicated CPU core. They also offer Bare Metal Instances that allow you to deploy dedicated servers on their platform, and pay hourly. They only have one bare metal plan right now, with an Intel Xeon E3-1270v6 CPU (8 cores @ 3.8 GHz) and 32 GB RAM. In our experience, Vultr’s network reliability has been stellar, and in several years we’ve only observed a few downtime incidents, which have always been isolated to one datacenter. That’s quite impressive given how many datacenters that they have to maintain! All in all, Vultr is an incredible VPS provider, and has been my go-to provider outside North America. Although their pricing is above-average, what you get is well worth the price. As I mentioned earlier, if you’re interested in Vultr’s platform, you can give them a try for free with their $5 trial offer.